The pre-poll estimation of the Congress's grassroots level managers is that the party stands a good chance of winning more seats this time compared to its 2012 tally of 61 in the 182-member Assembly. RAJKOT: With curtains set to come down on electioneering for the first phase of the Gujarat Assembly polls tomorrow, a close contest seems likely between the BJP and Congress, which probably mounted the most spirited campaign against the ruling party in over two decades. The pre-poll estimation of the Congress's grassroots level managers is that that the party stands a good chance of winning more seats this time compared to its 2012 tally of 61 in the 182-member Assembly. The saffron party, ruling the state for over 19 years now, had romped home bagging 115 seats. The BJP, however, is dismissive of the Congress's optimism, insisting it would come out with flying colours on the strength of the performance of its successive governments. In the absence of any leader with pan-Gujarat appeal, both contenders to power heavily relied on the charisma of their national leaders in an attempt to swing votes in their favour. While Prime Minister Narendra Modi powered the high-pitch BJP campaign, assisted by party chief Amit Shah, considered a master strategist after a string of electoral victories the party registered under him, the Congress's fight was led by a manifestly transformed Rahul Gandhi, who looked more sure- footed and less tentative. Rahul Gandhi spearheaded the Congress's campaign at a time when the party has been out of power in the key western state for 22 years now, and days before he steps into the shoes of his mother Sonia Gandhi, who helmed the grand old party for 19 years. A BJP victory will consolidate Modi's position even further and would be seen as an endorsement of his government's reform measures, including the GST and note ban, while a win for the Congress will kindle hopes of its revival after debilitating electoral reverses state after state. A defeat for BJP in Modi and Shah's home state, observers feel, may catalyse formation of a broad-based anti-NDA secular front ahead of the 2019 general elections. 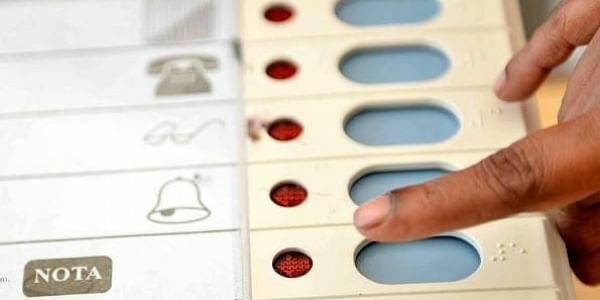 In the first phase on December 9, a total of 89 assembly seats spread over Saurashtra and South Gujarat regions will go to the polls. There are 977 candidates in the fray. The BJP started off its campaign blitzkrieg with Modi has its pivot and the catchline--Hu Chu Vikas, Hu Chu Gujarat' (I am Vikas (development), I am Gujarat). The Congress targeted the ruling party over the very same issue of development, claiming in Gujarat "vikas gando thayo che (development has gone crazy)." The Congress's optimism, apart from the possiblity of anti-incumbency factor working in its favour, also stems from it having secured the support of three young caste leaders-- Patidar quota stir spearhead Hardik Patel, OBC leader Alpesh Thakor and Dalit activist Jignesh Mewani--ahead of the elections. While Patel has extended his Patidar Anamat Andolan Samiti's support to the Congress, Thakor has already joined the party, and Mewani, who is contesting the Vadgam seat, is being backed by the Congress. All these leaders shot into prominence while leading agitations for their caste groups in the post-Modi Gujarat. Many feel the BJP held sway over Gujarat, particularly after Modi took over the reins of power in the communally sensitive state, owing to the consolidation of Hindu votes in its favour. The emergence of caste leaders on Gujarat's political firmament may somewhat dent the the Hindu support base of the saffron party. On the rise of caste politics in the state, where the BJP has been highlighting its model of development, Gaurang Jani, a sociologist, said it was because the issues faced by these groups had not been properly addressed. Jayesh Thakrar, a political observer, said "Anti-BJP sentiment simmering for long in the Patidar community came out openly through the agitation for reservation." "Many Patidars know the demand (for quotas) cannot sustain itself on technical grounds, but they feel there is a need to demonstrate their electoral strength through ballot. How they will show it will be known only on the counting day." The BJP's election managers, however, dismissed suggestions that the support of caste leaders would lead to a turnaround in the Congress's fortunes. Harshad Patel, a state BJP spokesperson, said, "We have identified several small groups and sub-castes within the OBCs, which are not very vocal but their presence in certain pockets is very important." "While the Congress is largely wooing Patidars, we have kept OBCs with us. We also have our own committed Patidar support which will not move away from the BJP." Manesh Doshi, a Gujarat Congress spokesman, said though the Congress has been critical of the BJP governments in the state and at the Centre it was only now, when people, especially farmers and the business community, facing the heat of their programmes and policies, found that the opposition party was right. "The way demonetisation was thrust upon people and no suggestions from business community were accepted while formulating GST, people realised this government does not care for anyone," he said. The Congress campaign was largely focused on issues such as minimum support price for groundnut and cotton, inadequate infrastructure, hurdles in implementation of Goods and Services Tax (GST). Modi, while not letting go of the BJP's development plank, which yielded rich electoral dividend for the party in the past, was bitterly critical of the dynastic politics of the Congress during his agressive campaign.